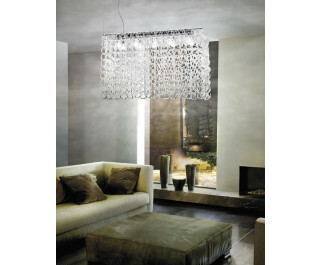 The Giogali chandelier from Vistosi is designed by Angelo Mangiarotti. This collection of lamps are composed of handmade crystal elements which can be combined as desired on standard steel structures or on structures specifically designed for the client. This is a beautiful structure of double -horseshoe rings of glass ribbon, exploiting the skills of the glassworkers based on the island of Murano.